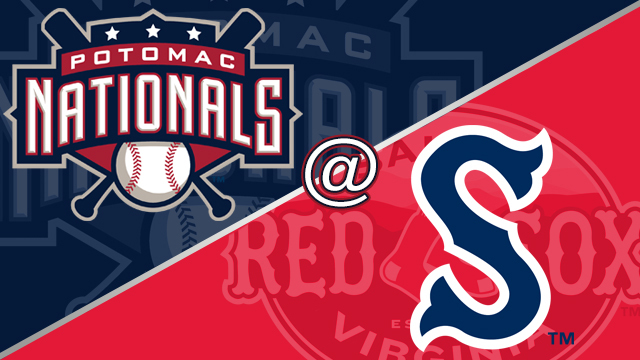 Salem, VA---Persistent rain forced the suspension of what was game one of a doubleheader between the Potomac Nationals (26-21) and the Salem Red Sox (23-25). Rain paused the opener in the bottom of the third inning, with a runner on first base, and one out, with no score. The teams will now play two games on Thursday. The suspended game will go the full seven innings, while the back half of the quasi-twin bill is a scheduled seven-inning matchup. The suspended game will resume at 5:00pm. The Potomac broadcast will get underway at 4:45 with the "P-Nats Lead-Off Show." The broadcast can be heard on potomacnationals.com or via the TuneIn Radio App. The Potomac Nationals of the Carolina League play at Northwest Federal Field at Pfitzner Stadium in Woodbridge, Virginia, and are the Carolina League affiliate of the Washington Nationals. The Potomac Nationals have claimed five Carolina League Championship titles (1982, 1989, 2008, 2010, and 2014) and nine CL Northern Division Championships. Sponsorship opportunities for the P-Nats' 2018 season and beyond are available, as well as all-inclusive corporate picnic outings to watch the future stars of the Washington Nationals at The Pfitz. 2018 Potomac Nationals season tickets and mini plans are now on sale. For more information on Potomac Nationals 2018 season tickets, mini plans, group outings, picnic packages, fundraisers, and all things Red, White, and Blue, visit the P-Nats online at www.potomacnationals.com, follow the P-Nats on Facebook (@PotomacNationals), Twitter (@PNats42), and Instagram (@pnats42), or call the Potomac Nationals' Extreme Custom Collision Ticket Office at 703-590-2311.